How would you describe the work of designer-illustrator Pete Cromer? Colourful, yes. Vibrant, definitely. Happy, without doubt. Playful, big tick. 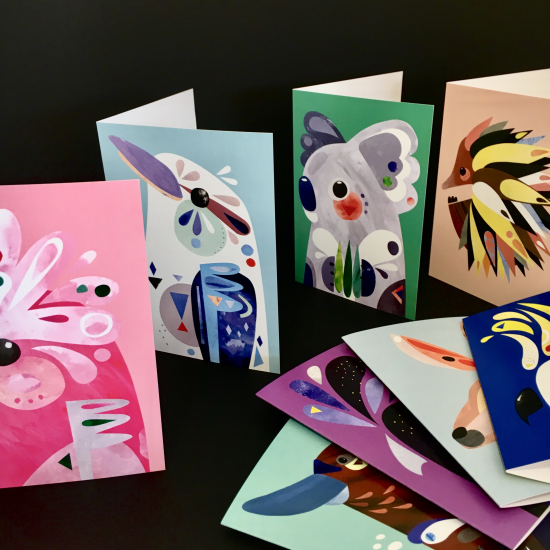 The Geelong-Surf Coast artist’s creations bursts with colour and fun and he has an impressive versatility – from resin budgerigars to quirky druids, Australian bird and animal prints to greeting cards and collectible pins. And he has collaborated with Laura Blythman on the Enemies Yay range of art and products. Print Together has worked with Pete for a number of years to produce a range of gift cards on 350gsm, 100% post-consumer recycled Ecostar Silk paper. Gift cards are an easy and affordable way for artists to sell work. Illustrations, photos and designs work beautifully on our recycled paper.